Wow. Where to start? Well, being given the opportunity to review this set of classic Doctor adventures feels a bit like being given an early Christmas present. Not one of those disappointing ones either, where you unwrap a massive box only to find your parents have decided to have a laugh at your expense, and have hidden a pair of socks in it. My parents used to do things like that, but they introduced me to Doctor Who as well, so I can’t really complain. This series of four new Doctor Who audio adventures does exactly as it says on the tin (well, CD insert). 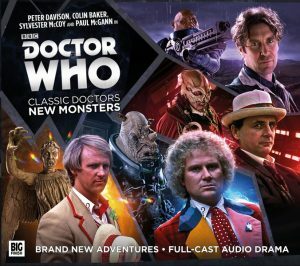 It delivers a set of four stories featuring ‘Nu Who’ monsters but pairs them with classic Doctors. So we begin with Fifth Doctor story Fallen Angels by Phil Mulayne, where in modern day Italy, honeymooners Joel and Gabby Finch break into a church to find a very specific statue (interesting fact: Diane Morgan, who Charlie Brooker fans will recognise as the mighty Philomena Cunk, plays Gabby). It doesn’t take much to work out what happens when the newlyweds discover that this statue has been replaced by something just a little bit sinister. A word of advice? Don’t blink. 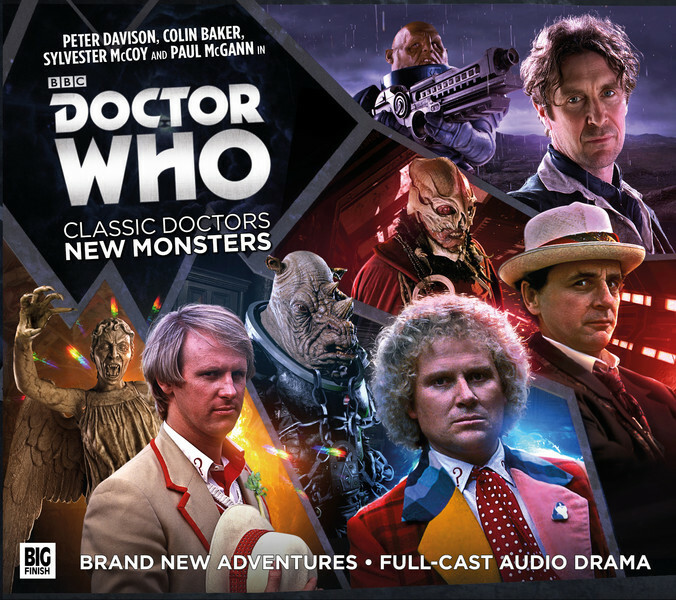 Next up, Colin Baker in a Sixth Doctor story penned by Simon Barnard and Paul Morris; Judoon in Chains. Here, Colin Baker is at his pontificating best; a little like Boris Johnson in a multi-coloured suit, defending a creature that has been captured and bound in order to be paraded at a Victorian Freak show. So what exactly will the ticket-buying public of England in 1884 make of a rhinoceros in a kilt? Harvest of the Sycorax by James Goss features the Seventh Doctor. In line with the spirit of the televised adventures, this story starts dark and remains that way. So there’s no spoon playing, no mixed metaphors and no clowning. It’s Machiavellian McCoy, and here we have a story set in the far future, where the human race has developed a remedy for everything. This is great news for Zanzibar Hashtag (best name in sci-fi ever), who has no need to be sad, scared, stressed, or depressed ever again. Or does she..? Finally, we have The Sontaran Ordeal, written by Andrew Smith and starring Paul McGann as the Eighth Doctor. Set during the Time War, the premise is simple enough: Sontaran law dictates that any Sontaran who fails a mission must endure an ordeal to the death. And the death, of course, must be honourable and brave. Our favourite baked-potatoes may not be ‘Nu Who’, but ‘Jask the Foe Slayer’, played here by Dan Starkey adheres to the ethos of Nu Who by teaming up with the Doctor. And instead of being played for comedy value (I mean you Strax – though you do make me chuckle), the Sontarans here are back to their war-mongering finest.